The results are in and the safest small family car for 2014 is, according to Euro NCAP’s figures, is the ever popular Nissan Qashqai. Indeed, the crossover recorded the highest score for any small car tested last year and now makes hat-trick of good results for the carmaker with the X-Trail and Pulsar also scoring five stars. 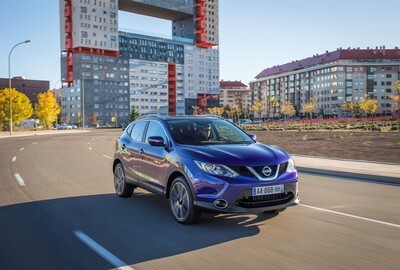 The assessors found that the Nissan Qashqai provided exceptional performance in their adult and child protection tests. When tested, the passenger compartment of the Nissan Qashqai remained stable during the front impact tests with especially good protection for elbows and knees of the passenger and driver. Indeed, the driver dummy achieves maximum points with excellent levels of protection for every region of the body. The car’s side barrier also provided lots of protection for the body. However, the Nissan Qashqai has been engineered to provide high levels of protection for children and the vehicle scored particularly well in protecting infants. The results from Euro NCAP should not really be a surprise for anyone who has driven a Nissan Qashqai or examined its safety kit list. When combined, all of the safety features make up the Nissan Safety Shield to offer impressive levels of passive protection for the occupants and driver. Among the features are driver attention alert, forward emergency braking, high beam assist and lane departure warning. There’s also traffic sign recognition, blindspot warning and the detection of moving objects as part of the system to protect the car from hitting other vehicles or objects on the road. The Nissan Qashqai has slipped down the bestseller lists, it was the sixth bestselling vehicle in the UK last year, but it is something of a British success story. The car has been designed and engineered in Britain and is built at the Nissan plant in Sunderland. The Nissan Qashqai is the original crossover vehicle which gave car buyers an impressive vehicle and it’s so popular that a new model is built every 61 seconds. Alongside the Qashqai, Nissan is also seen surging growth for its impressive electric car, the LEAF, as well as the Juke and Note – all produced in the same factory. The factory built more than half a million cars last year and employs 6,700 people who will help the factory reach the 8 million cars being produced milestone later this year. This entry was posted in Awards and Reviews, Car Leasing, Cars, Crossover Cars, Popular Cars and tagged Euro NCAP, lease a Nissan Qashqai, nissan, nissan Qashqai by Steve Lumley. Bookmark the permalink.